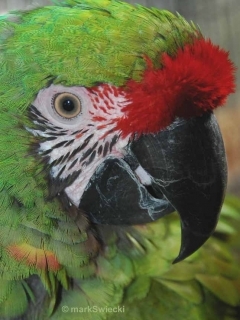 The Military Macaw is so similar to the Great Green Macaw in coloration that it is almost indistinguishable. Large, mostly green macaw with bright red forehead patch, blue flight feathers and bright sky blue rump. Bare face with fine lines of black feathers. A.m. militaris: Both adults green, olive wash on back and wing covers; blue suffusion on crown to neck, forehead and fine lines on lores red, throat olive/brown, upper tail dark brown/red and tipped dark blue. Bill grey/black, pink/white face which turns darker pink when excited. Fine lines of feathers on face green/black. Eye yellow. A.m. mexicana: Both adults larger than militaris. A.m. boliviana: Both adults as in militaris but throat red/brown, red bases to feathers of ear coverts; tip of tail and outer webs of primary feathers darker blue. As in adult but tail shorter. Eye grey. Loud, harsh; also raucous and drawn out; shrieking. Calls audible at some distance. Fairly common in US; rare in other countries. Should have access to a large enclosure at least 15m (49 ft) for at least part of the year; keeping permanently indoors not recommended. Soaked or sprouted sunflower seed; nuts including: walnuts, pecans, Brazil nuts, pine nuts; vegetables and fruit such as: corn on the cob, banana, orange, apple and others; if possible, palm fruits; complete pellet for macaws. Are chewers, need bird-safe woods such as: fir, elder, pine and willow to chew on; also heat sterilized pine cones, large vegetable tanned leather and wood toys. Enjoys bathing. Horizontal macaw box, 16" x 16" x 48" (40.6cm x 40.6cm x 122cm) or 35 gal. (133 L) pickle barrel. Habitat loss (32% in Mexico alone) and domestic wild bird trade, particularly in Mexico and Bolivia. Gold mining in Mexico also threatens habitat. A.m. militaris: Tropics of Colombia and NW Venezuela, south to the E Ecuador and Urubamba region, SE Peru; rarely to Pacific slope of Andes in Peru. Found in foothills of mountainous areas in wooded country with valleys from 500-1500m (1640-4920 ft); sometimes to 2000m (6560 ft). Also regularly to sea-level in Pacific Mexico and Colombia. In Mexico mostly secluded uplands in dry woodland; occasionally in lowland humid and riparian forests. In Colombian Andes humid forest. In Venezuela in rainforest to 600m (1968 ft). Feeds on variety of fruits, nuts. Mostly found in pairs or small flocks of up to 10; roosts in far greater numbers. Roosts communally on cliff faces or large trees. 2-3 elliptical eggs, 46.5 x 33.0mm (1.8 x 1.3 in).